We Happy Few is currently in early access alpha, the final version of the game may vary substantially from our time with the game. Please treat the below opinions as such. 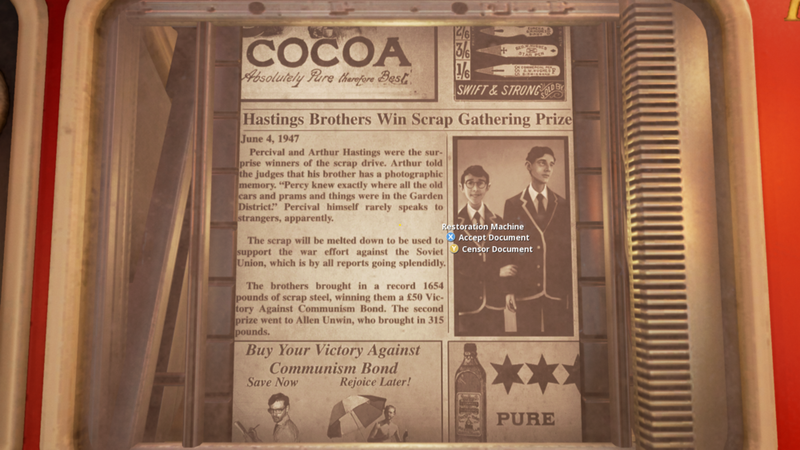 Taking the reigns of unassuming corporate yes man Arthur Hastings is an interesting experience, the game's opening scenes see you working as an editor for the Wellington Wells newspaper company, which like a lot of today's media outlets, control exactly what the townsfolk do and don't see. Arthur is tasked with ensuring only "happy" news hits the stands, erasing anything negative well before it goes to print. The game takes place in October 1964, Germany defeated the British in World War 2 and the majority of the English population have been wiped out. Wellington Wells, a small sleepy island town, managed to fight off the Soviet Invasion by doing something "horrible", the residents of town choose not to remember such acts and instead develop a drug called "Joy", which aids in forgetting the past. The Joy Pill is only taken in capsule form and is also used to treat food and water, ensuring the citizens' blood levels remain consistent. Joy helps residents remain blissfully unaware of all but their current surroundings, anything that impacts their mellow mentality is subject to immediate expulsion by any means necessary. During your shift a brief flashback hits you, which then leads to various awful and haunting old memories flooding into your mind. You instinctively reach for a "Joy Pill" and are prompted as to whether or not you want to take said pill, you refuse and instead throw them away, becoming a "Downer", an outcast and scourge of society, which sees you banished to the Wastes. You later awaken in a safe house, wondering aloud what the hell has happened, where you are, and "what happens when the memories come back?". Years of medication has left Wellies (the "normal" residents of Wellington Wells) numb and overall emotionless. Wandering around the safe house you are almost born anew, gradually becoming more self aware of the real world around you. It is in the safe house you learn about how to craft items such as weapons, medical equipment or clothing and how your inventory works overall. You will also have your first encounter with needing to sleep, you see We Happy Few as standard plays as a permadeath game, what's that? Well put it simply it incites real world needs such as food, water and rest to ensure your survival, and when you die in game, it's game over. 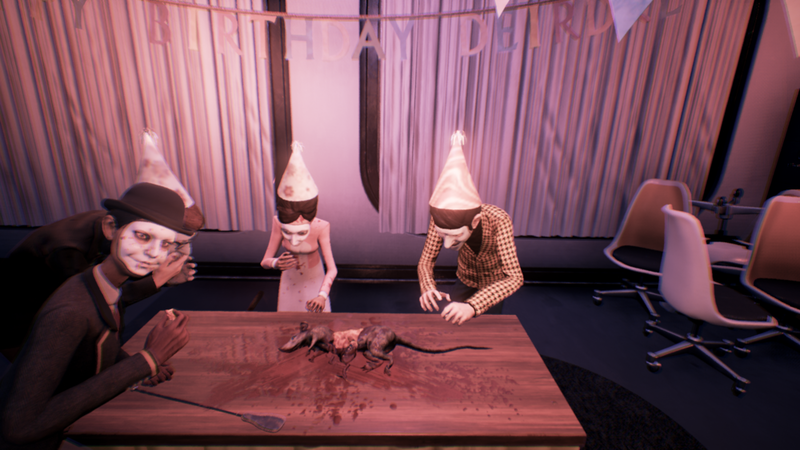 The biggest difference between most survival games and We Happy Few is that there are no monsters, you won't encounter radiated beasts or horrific scientific experts in WHF. That isn't entirely true, there are monsters in the game, but they are human, and some of whom you will meet along the way are far worse than any rad scorpion or super mutant. In addition to Wellies, Wastrels now reside in the outskirts of the town. They have either become mentally ill as a result of excessive Joy use (perhaps even suffering a poor reaction to the meds), or they’ve become so addicted to the substance that they act in a way similar to opiate addicts, unable to function in society, and always searching for their next hit. The Wastrels are just as volatile as the Wellies, but for different reasons. On top of the residents you will also encounter local law enforcement, who are anything but forgiving when it comes to anyone not currently under the influence of Joy. At times you are forced to consume the drug in order to save yourself by blending in, take too much and it's game over. Your job? To escape the Wastes, enter Wellington Wells, and somehow exit to a train station undetected, utilizing Joy, your wardrobe, and other tools to your advantage. There are also safe houses located throughout the world to provide cover, a chance to catch your breath and rest in times of need – you just have to reach them in time. Throughout my time with WHF I found the completionist in me taking over, random side quests proved a constant distraction during my play through, interacting with various NPCs and getting swept up in their often dark and depressing stories had me veering off the path to help them. The occasional glitch during conversations proved to be a pain, 4 times during my playthrough I was forced to save, quit and reload in order to advance the game. My other gripes with WHF are to do with the inventory (the colour scheme makes it hard to see what you're looking at), and the interactive map is erratic, trying to navigate my way around it was a constant dice roll, zooming in too far caused the map to freeze, not far enough and I'd hit an invisible barrier. These issues aren't game breaking but certainly take away from the experience. The controls are reasonably intuitive, anyone who has played any Bethesda title will feel right at home. Throughout your time in Wellington Wells you will find yourself constantly foraging for scraps as well as breaking into various homes and buildings to find supplies. Your hunger, water and sleep levels are in a constant downward spiral, and often take priority over the various side quests you stumble upon. 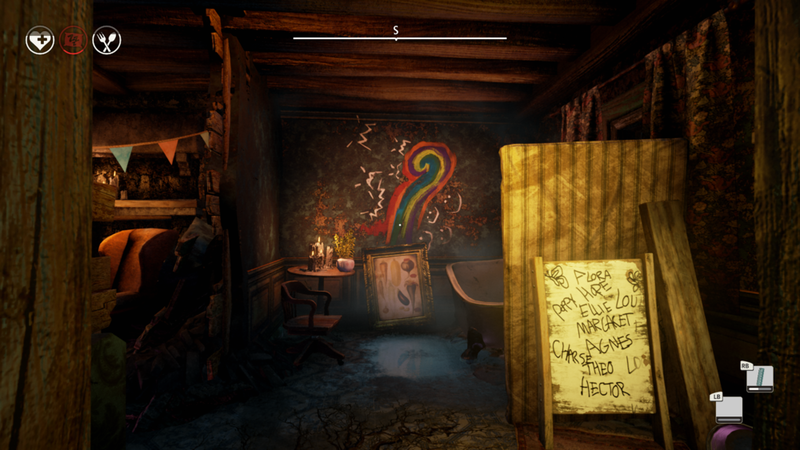 Graphically We Happy Few, even in it's early alpha state is impressive, the freaky clown like character models and dynamic shadow and lighting effects create a very tense and uneasy universe. The contrast when you take Joy is a sight to behold, surroundings change in front of your eyes as you transition into your euphoric state, the dynamic between the dark, cold reality as opposed to the bright, vibrant drug high was at times rather unsettling. 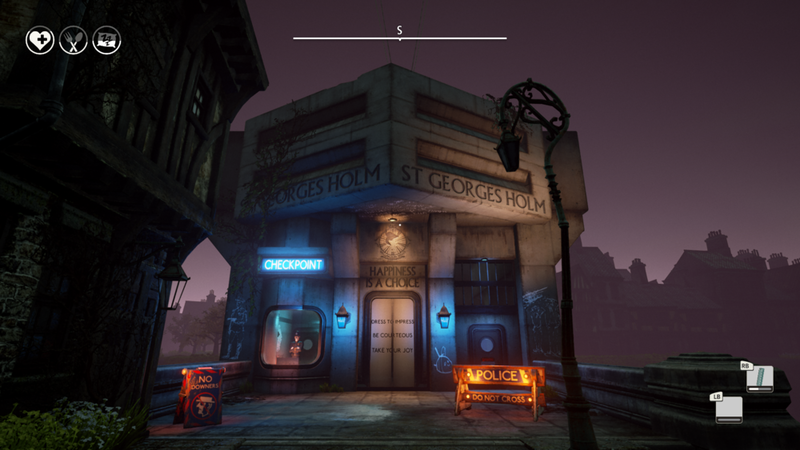 A dystopian world borrowing elements from Bioshock, Fallout and A Clockwork Orange certainly has the potential to be something great, but after 12 hours exploring the world of Wellington Wells I was left underwhelmed and with no overly strong feelings towards the game. 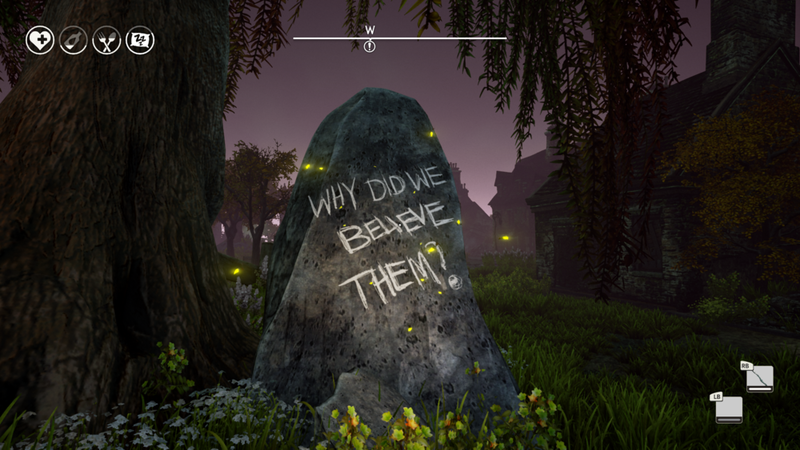 Compulsion Games have laid an interesting foundation that oozes potential but fails to hit the home run in its current state. Here's hoping the final release is the game the internet community has hyped it up to be.